Who can be referred to Home-Start Haringey Hackney and Waltham Forest? Home-Start Haringey Hackney and Waltham Forest welcomes the referral of any family living in the borough with a child under the age of 12. We can support families who for whatever reason are finding it hard to cope; perhaps because of isolation, the illness or disability of a child, or coping with the demands of a multiple birth. We will carefully match a volunteer to meet the needs of each family. 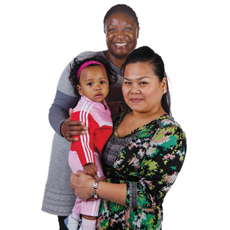 Home-Start Haringey Hackney and Waltham Forest receives referrals of families in different ways : from professionals, such as GPs, social workers, health visitors or teachers; from community groups; or direct from a parent. If you feel that you would like the support of a Home-Start volunteer, you can contact us directly. 'What is Home-Start?' leaflet here. 'Information for Families' leaflet here. 'Information for Referrers' leaflet here. To download the referral form click here and either return it to us by post or email. Contact details are on the form itself. A member of our staff will make contact to arrange to meet the referred family, and if our service is accepted, they will be matched with a volunteer. Our support is then reviewed on a regular basis. If the need identified relates to play, the family will be initially supported by the Family Link Play Worker.